Home Dog Care Are Christmas Trees Poisonous to Dogs? 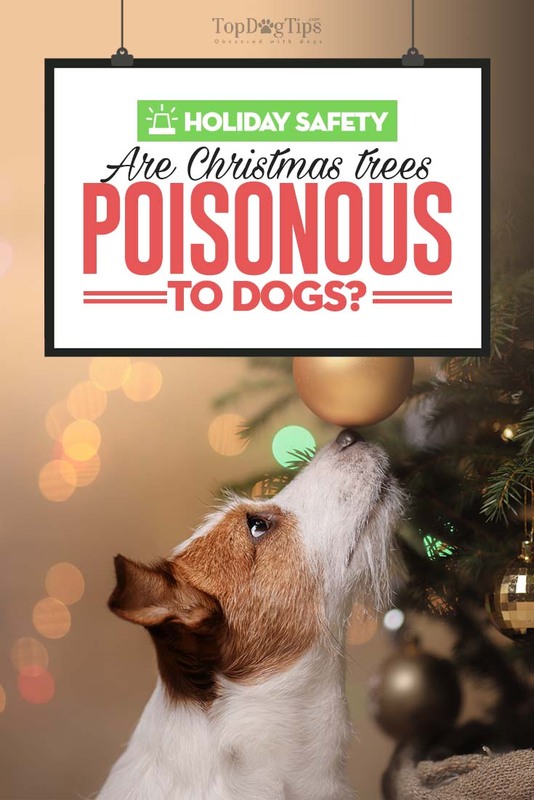 Every dog owner knows that dogs will put almost anything in their mouths, and since they are often completely phased by Christmas trees, it is completely logical for you to wonder whether they are poisonous to dogs. The answer to this question, are Christmas trees poisonous to dogs or not, is of course more complicated than a simple yes or no. Christmas trees themselves are not poisonous to dogs. However, oils from fir trees can be mildly toxic and cause slight stomach problems and mouth irritations in dogs. Needles on these trees can also be extremely dangerous. Also, keep in mind that it's not just the plants and foods around your home that can be seen as edible by your pet. Dogs – and puppies especially – are attracted to shiny objects, small trinkets and many other decorative objects that you may hang on your Christmas trees. While they aren't edible, Christmas lights, the decorations dangling from a tree and garland can be very dangerous to your pet as well. These things will tear or puncture the dog's digestive tract. They could also cause a bowel obstruction, which will either result in death or a very costly surgery to remove the blockage, among other health issues. When you consider everything that goes in and around the Christmas tree, it is safe to say that the best course of action is to keep your dog away from it. When you're decorating for any holiday, be aware of what your dog will have access to. Ensure that anything that could harm him is up high and secured. So are Christmas trees poisonous to dogs? No, they're not, but it's not an accurate way of looking at this. There's more that goes on on and around Christmas trees that pet owners should be aware of because it may pose danger to dogs such as commonly used Christmas decorations that could be very harmful to our canine companions, and how to keep your dogs away from Christmas trees. How Poisonous are Christmas Trees? The fir trees (as well as spruce and pine trees, which are also used as Christmas trees) are not poisonous to dogs. However, their oils and needles can be hazardous and cause health issues like stomach ache and mouth burns or irritations if your dog swallows them or chews them. If you are able to choose a non-shedding Christmas tree, or artificial Christmas trees, do that. They are safer for dogs, and you can save yourself from worrying at all. This plant is traditionally used as a Christmas decoration and it is believed by ancient cultures that it can protect the household from various evil spirits. In Christian tradition, the spines represent the crown of thorns and the red berries represent the blood of Christ. It is a rather beautiful plant, but it is also very dangerous for your pooch. Holly is considered to be very poisonous to dogs. However, since it has an extremely bitter taste and sharp leaves, dogs will most likely stay away from it. Still, even a small quantity of this plant is enough to make your dog pretty sick. Holly is actually pretty poisonous to humans as well, and can cause some serious digestive problems like vomiting and diarrhea. In fact, ingesting over 20 berries can even be fatal to children. You should also make sure that your dog doesn’t mistake the branches of holly for a chew toy. He can injure himself and cut his mouth on these leaves. Mistletoe has become increasingly popular in recent years, and having live mistletoe in your home is something that is practically common, as well as making table centerpieces and wreaths from it. However, you should be careful with mistletoe since it is very poisonous to dogs. If your dog eats mistletoe he can have serious gastrointestinal problems, but that is probably the least of it since he can also experience breathing difficulties, heart problems and nerve or brain damage. If you are not sure that you can keep your dog away from the mistletoe, you better think again about having it in your home for Christmas. We've answered the question, are Christmas trees poisonous to dogs, and now it's time to talk about different berries that often find their way into our homes during Christmas as part of various decorations and displays. Also, many people enjoy cutting their own berry branches during walks and making them into arrangements and decorations. If you are not sure what type of berry you are using exactly, that can be a potential danger to your dog. Even though most of the poisonous berries are not interesting to dogs since they have a bitter taste, that is not true for all berries, which means that you need to be really careful. Also, some dogs will eat things without tasting them first, and that can be the case with some toxic berries as well. The Poinsettia is often given as present on Christmas and it is a very popular Christmas plant thanks to its widely attractive and bright red leaves. Even though it was considered that poinsettia was extremely poisonous to dogs, that is not really the case as some recent studies have shown. It is, however, toxic to dogs, but the effects are rather mild than severe. Ingestion of poinsettia can make your dog suffer from gastrointestinal problems and it can also cause skin irritations if it is touched or rubbed. So, if you really want to have poinsettia in your home at Christmas, you should keep it out of the reach of your dog. What about Artificial Christmas Trees for Dogs? Are Christmas trees poisonous to dogs? That question is usually directed at real trees, but what about the artificial ones? Generally, most artificial Christmas trees are much safer for dogs than real ones. However, they can also be dangerous for your dog, but the extent of that danger depends on the material that they are made of. In most cases, parts of artificial trees will not cause any life-threatening situation for your dogs. But, it can cause them a lot of problems nonetheless. For example, as the tree ages, it becomes more brittle and small pieces of it can break off and cause mouth irritation or intestinal blockage if your dog eats it. This is true for plastic and aluminum, but even some other materials can be hazardous for your dog. If you notice that your dog has eaten some part of the Christmas tree, take him to the vet as soon as you can. In addition to plants and tree itself, your dog can have health problems from other things found on or around the Christmas tree. For example, tree water can be very poisonous for your dog. Since tree water is usually enhanced with fertilizers, preservatives and pesticides, it can be very harmful to your dog. It is best to make sure that your dog can’t drink the tree water, so use a covered tree water dish just to stay on the safe side. If you've been wondering, “Are Christmas trees poisonous to dogs?,” you've also got to think about other dangers. Another thing to be wary of are Christmas lights. Try not to string the bottom of Christmas tree with them. First of all, they can get very hot and burn your dog. Also, some dogs will chew on electrical cords and cables, which can make them receive mouth burns and electric shocks, or in the worst case, even cause pulmonary edema which can be fatal. Keep in mind that tinsel is extremely dangerous for your dog as well, and if you can, avoid trimming your tree with it. If your dog eats tinsel, it can cause him to suffer from vomiting, loss of appetite, diarrhea, lethargy and weight loss and it will probably be necessary to have a surgery to remove the tinsel from his stomach. Christmas ornaments can also be poisonous to your dog, but that depends on the material that is used to make them, and in some cases, that can even be fatal for your dog. However, even if they are made from safe materials, some of them can present a real hazard for your dog. Glass ornaments are a great example of unsafe Christmas materials for dogs. They can easily break and cut your dog. Also, avoid using edible ornaments since they can present too much of a temptation for your dog and he can tip the tree over and injure himself in the process. In order to be sure that your dog is safe and sound during Christmas, you need to more than just the simple question “Are Christmas trees poisonous to dogs?” You should keep him away from the Christmas tree and allow him near it only when you are around and watching him. That can sometimes be a hard thing to do, but you can take certain steps to ensure that your dog is safe. Put your Christmas tree in a room that can be closed so you can be sure that your dog can’t get to the tree without your permission. You can also surround the tree with a fence to make your dog unable to approach the Christmas tree completely. When you are not home, you should confine your dog to a different room and keep him away from your tree. Also, when you choose the location of the tree, try to put it in a low traffic area. Placing your tree in a corner is probably the best idea and chances that your dog will tip it over are not as high as they would be if you put the tree in the middle of the room. You can also use some tricks to keep the dog at bay. For example, use some items that have a strong smell, preferably menthol or cinnamon, to spray your tree with. They will act as a dog repellent since dogs have a strong sense of smell and will most likely avoid going near such strong smells. You can also place aluminum foil around the tree, or some sticky mats since many dogs, especially puppies, will avoid walking on these surface types. If you have a dog, you simply have to be extra careful during the holidays if you want to make sure that both you and your canine buddy will have a nice and stress-free time. If you've been wondering “are Christmas trees poisonous to dogs?,” then chances are you're aware of the dangers of this holiday season for our pets. Be aware of these dangers when decorating, and you'll create a safe environment for every member of your family.